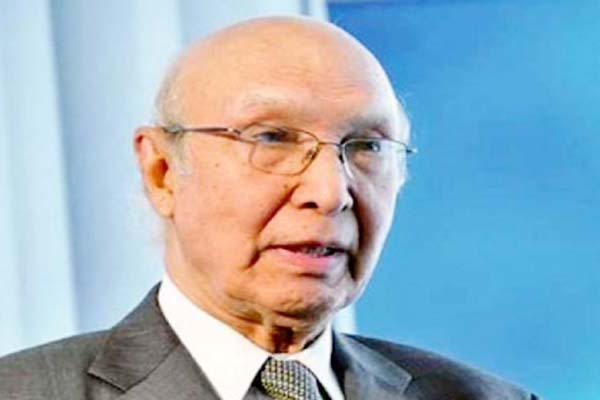 ISLAMABAD, Sep 26 (APP): Advisor to Prime Minister on Foreign Affairs Sartaj Aziz Tuesday said Indian government’s efforts to isolate Pakistan diplomatically received a severe set back. He said about 56 countries of the Organization of the Islamic Cooperation (OIC), Human Rights Council of the United Nations and other world bodies have supported Pakistan’s stance on Kashmir by outrightly rejecting India’s baseless allegations. Winding up discussion on motion regarding Pakistan-India ties in the Senate, he said Pakistan had strongly rejected Indian narratives. He informed that the government of Pakistan had addressed letters to the world leaders highlighting the grave situation in the IoK, besides handing over of dossiers containing facts about the ground reality. The United Nations Human Rights body had also been requested to send a fact finding mission to the occupied valley, he added. The Modi government was trying to impose Indian hegemony in the region with its own narratives which was unacceptable to Pakistan, he emphasized. The Advisor said the recent Intifada in Indian Occupied Kashmir was of great importance because new generation was carrying forward the freedom struggle and it would be the golden chapter in the history of struggle against Indian occupation forces. He said for the last 75 days, the innocent Kashmiri people had been facing Indian occupation forces’ brutalities with valour. The Kashmiri people struggle was a reaction to the inhuman brutalities being perpetrated by the Indian occupation forces, he added. Sartaj observed that no force on earth could deter the determination of a nation that was ready to sacrifice everything for the achievement of its objective. He said Indian occupation forces have so far martyred 120 innocent Kashmiris since 8th July, and blinded dozens others with use of pellet guns. Sartaj Aziz said the liberation movement in Kashmir was purely an indigenous and spontaneous and brandishing such struggle for the right of self determination with terrorism by the Indian government was irrational. The Advisor underlined that resolution of the Kashmir issue was imperative for sustainable peace in the South Asia. He said the issue could only be resolved through comprehensive dialogue process. The Advisor also strongly rebuffed Indian claims over Balochistan by saying that there was no relevance between the situation in IoK and the province, adding it was an attempt to divert attention from the gross human rights violations in the occupied valley. About Uri incident, the advisor said Pakistan was ready to extend all possible support for investigation into the incident but it should be conducted by an international body. He said during the investigation process all the evidences should be produced before the investigators along with details of the incident. He said Pakistan had rejected all the allegations levelled by the Indian Prime Minister in this regard. The chairman Senate announced that the House was ready to provide a roadmap to address the issue. He summoned the session of the Committee of the Whole on Thursday at 10 am in the Parliament House to discuss it. Sartaj Aziz appreciated Chairman Senate for summoning the committee and assured to comprehensively present government’s viewpoint over the whole scenario.